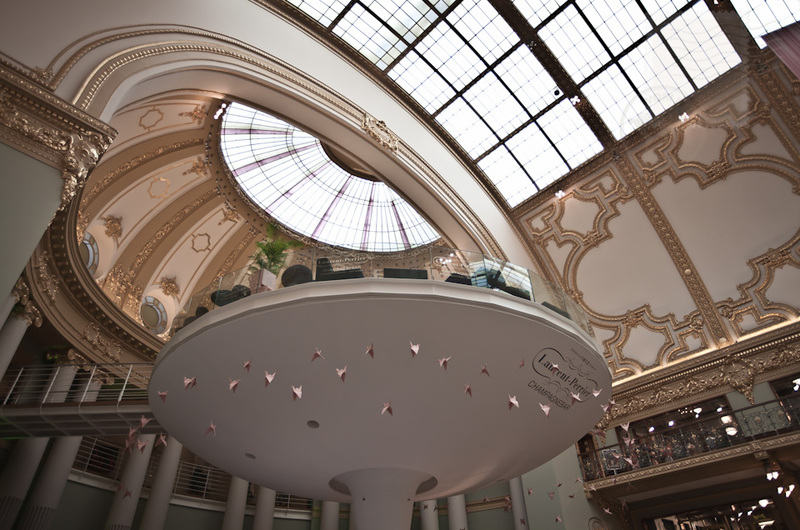 The “floating terrace” of the only Laurent Perrier champagne bar in the world looks out over the Stadsfeestzaal Shopping centre in Antwerp. I only drink Champagne when I’m happy, and when I’m sad. Sometimes I drink it when I’m alone. When I have company, I consider it obligatory. I trifle with it if I am not hungry and drink it when I am. Otherwise I never touch it – unless I’m thirsty. This entry was posted in europe, travel and tagged belgium, i love words. Bookmark the permalink. I know what you mean about a weekend when it seems like photos just aren’t working out. These are wonderful, though. And my favorite thing about this one is all those little origami cranes hovering around the champagne bar. Magical. I love the quote. I visited Antwerp a while ago I loved it. The only problem was that it took me forever to drive in Belgium because the town names where different in French and Dutch. Still it was fun!